A successful grower needs to maximize their yields, have timely, consistent output and not sacrifice their plants quality. For these reasons, many growers turn to cloning. To truly utilize plant cloning, you have only two real options. You can either use a rooting hormone powder or you can use a rooting hormone gel. Rooting gel is far superior of a method than using a rooting hormone powder or a water based home made solution. Rooting gel contains the rooting hormones that your plants need to develop from a cutting to a full fledged solo plant. The rooting gel as well has the added benefit of holding better around the plant as opposed to the old-fashioned rooting hormone powder which can layer on unevenly around the plant and as if you put nothing on the plant at all. Dipping your cutting in rooting gel will ensure an even spread of the rooting gel around the plant and bring you one step closer to having strong rooted clones that can survive on their own. Rooting powder also tends become less potent quicker than a rooting gel. For this reason we made sure that Midas Products Rooting Gel has a shelf life of two years from the time the container is opened. It's not just enough to have a rooting gel. 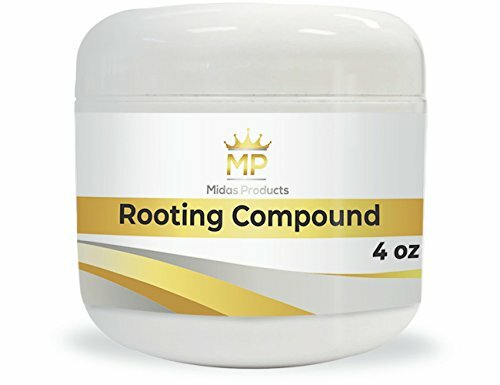 Having the right ingredients in your rooting gel makes all the difference, which is why Midas Products only uses an IBA Hormone in our rooting gel. IBA rooting hormone is known in the Horticultural world as the best way to guarantee your clones will develop strong enough roots to be transplanted and thrive as plants. Easy enough for a beginner, proven enough for a pro. If you have any questions about this product by Midas Products, contact us by completing and submitting the form below. If you are looking for a specif part number, please include it with your message.